It was a relatively quiet start to the week ahead of key data and event with more leaks from trade talks failing to get the markets too excited. Most markets traded in tight ranges overnight ahead of the key run of data and events that kick off today. There were more leaks from trade talks pointed to key concessions that will likely pave the way for a deal sooner rather than later. Markets appear to be getting trade fatigue which could limit the impact that the announcement of the deal will have. 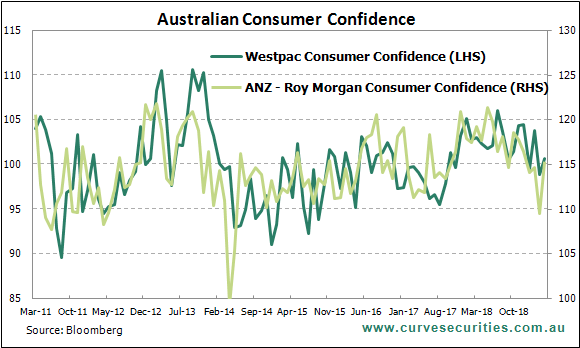 There was a little bit of better news for the domestic outlook with consumer confidence lifting a little over the last week and continues to recover from its early March low. The weekly ANZ-Roy Morgan consumer sentiment index rose to 115.3 from 113.2 over the last week. The biggest improvement was consumers perception of the economic outlook over the next 12 months. The minutes from the RBA’s April Board meeting are out this morning and there will be a little more focus that normal after the last sentence was chanced in the post meeting released two weeks ago. The slight shift in that last sentence could be a precursor of a broader change or it was simply a reflection of the shift from a hawkish bent to a more balanced outlook. We will find out at 11:30.